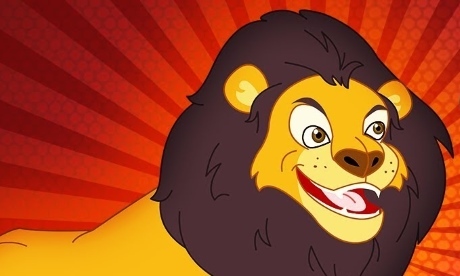 It was reported that the premium service built using the intergalactic monster that is YouTube was having a bit of a rethink and mobile phone behemoth Apple reannounced upcoming Netflix style service. And a credit card. Disney, the corporation that makes movies and owns a US TV network (ABC), is about to launch a Netflix-like service (called Disney+) and will cause some of the Star Wars and Marvel content to be taken from other on demand services. In theory, this should be good for the consumer: having a choice of providers who are competing for your time and money should keep prices down and quality up. However, economics suggests that these providers will want to combine their operations. That could lead to single operators who control the market and charge consumers premium prices to keep profits up. How is this going to affect the UK? Over the top internet on demand. It is hard to see how the current subscription sports services (Sky Sports, BT Sports) will be changed by the current OTT (Amazon Prime, Netflix) as premium sports is a highly lucrative business. The value of subscription sports services keeps pushing up the cost of paying for the rights to show these staged sporting events, at the cost of other forms of TV entertainment. Of the £7.5 billion spent in 2017 on “UK content” by UK broadcasters 60% went to the Premier League. In the UK, sports bodies like the Premier League are excluded from traditional thinking about market regulation. Normally even the smallest monopoly is dealt with quickly. Sports bodies, who run competitions between teams, create value by selling to companies the rights to broadcast these events. Having around 400 matches a year to pick from, this is highly suited to subscription broadcast TV. Time has shown that the value to the companies and players is passed on efficiently from fans to shareholders, seeming without limit. US company Comcast now owns Sky UK. What is interesting here, is that the spend on content has risen whilst income from licence fee payers and advertisers has declined. 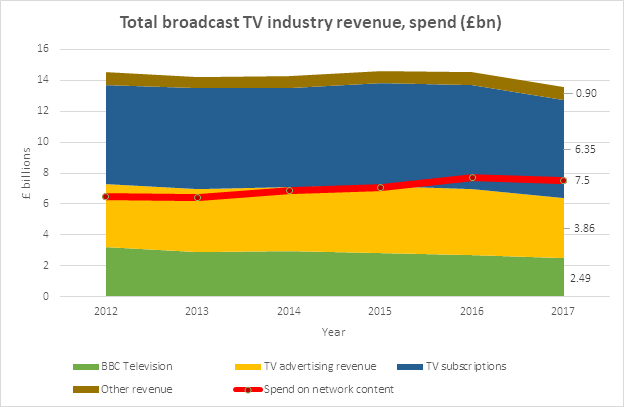 It is also interesting to see that the Public Service Broadcasters (BBC One & Two, ITV, C4 and C5) has fallen as a share of the total from almost half to about a third. This has coincided with a substantial decline in the average number of minutes watched from 241 to 203. 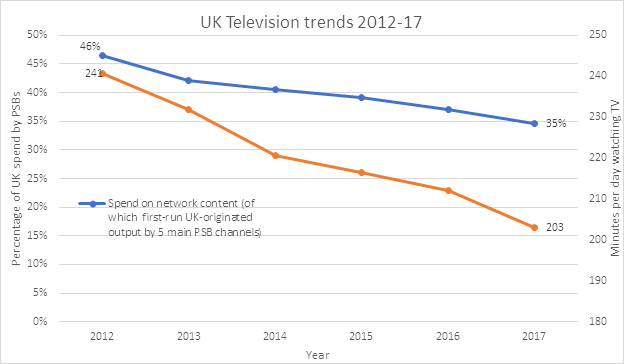 The decline is, in part, due to people using non-broadcast on demand systems like Netflix, but there is also the possibility that there is a systemic decline for public service broadcast television. This area is certainly the one in the easiest reach of the existing players. It is a considerable risk to create your own TV shows, and then have them exist in the fire of public appreciation. Like in ancient Athens, every TV drama, comedy, tragedy, dance-show and documentary undergo an instant evaluation. From online applause, the “overnights” number of viewers, the BBC appreciation index, the revenue generated from advertising to the professional critics. Broadcasters worldwide live with nightly “baptism by fire” of their output. It’s a risky business. Whereas, if you have dollars in the bank, it might just be easier to pick up a popular show, remaster it and treat it like your own. Therefore, it is less risky to get the rights to stream 236 episodes of 1994 period piece “Friends” in High Definition. In this light, the many TV channels that play old shows back to back, interspersed with adverts to keep broadcast costs down, are understandable. As lucrative as this strategy can be in the short run though, broadcasters are likely to encounter competition from on-demand services that can deliver the same content at greater scale and cost efficiency. Therefore, in a future with on-demands, the outlook for Alibi, Dave, Drama, Eden, Gold, Good Food, Home, Really, W, Yesterday and Sky One, Witness, Atlantic, Real Lives, Pick, Challenge seems time limited.